Learn how to download and and use the optional W2 software compatible with Procare’s Payroll module. NOTICE: For 2018 W2s, amounts are based on the Print Date (date of issue) of each check, rather than the Post Date (date of entry). This is intended to more accurately reflect the point at which a person received earnings. You’ll only notice the change if you posted a check in one year and printed it in the next. Checks posted in 2017, but printed in 2018 will be excluded since they were already counted as 2017 earnings. Checks posted in 2018, but printed in 2019 will also be excluded since they will be counted as 2019 earnings. You’ll need to obtain W2 (and/or 1099) forms compatible with Procare—Print a Sample W2 Form. Forms must be in 2-per page format. That is, two W2’s (or 1099’s) are printed on each 8-1/2 x 11 sheet of paper. The lines and boxes must be preprinted on the forms. Do NOT purchase blank forms. Purchase forms from your local office supply store or, for guaranteed compatibility, contact Dynamic Systems. Make sure your payroll check (and vendor check) information for last year is complete. Review the instructions provided by the IRS for Form W2, Form W3, Form 1099-MISC and Form 1096. IT IS YOUR RESPONSIBILITY to comply with the rules and regulations explained in the IRS publications – which may be printed from within the software in .PDF format. Procare has made every effort to ensure the accuracy of the information in this program; however, the ultimate responsibility for your employee W2s and vendor 1099s is in your hands. Please check every document for accuracy. Questions regarding tax regulations should be directed to the appropriate federal or state agency or to your accountant. Procare Support can only answer questions about the software itself. If you’re a non-Cloud customer, you must have Procare version 2018.6 or higher installed to use the W2 software. See: Check for online updates. Log on to your computer with local administrator privileges and close all programs. Exit out of Procare completely. Important! 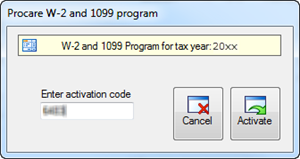 If you have a prior year’s W2 and 1099 software installed, you must run the installation twice. The first time uninstalls the old software. The second time installs the new software. Once the software is installed, log in to Procare. 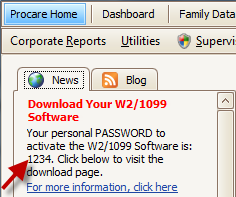 From the Procare Home screen go to Utilities > Procare Extras > W2s and 1099s. The first time you open the program you’ll be asked to enter your Activation Code. If you install on more than one computer, you’ll be asked for the code at each computer. Your Activation Code will appear on the Procare News tab about 1 business day after your order is received. If you placed your order online, your Activation Code is always available at www.procareonline/store. Click Order History (at the top) to view the Details of your order. Click Data Source and Select a Region. If you have more than one region you’ll generate W2s for each one separately. If you were previously working in the W2 & 1099 software (and saved your work) you may choose to Load Previously Saved Data to pick up where you left off. Click Company Info and enter the contact information, making sure to include your Employer Identification Number (EIN), sometimes referred to as your tax ID number. Your Business Services Online User ID (upper right), established when you register at the Social Security Administration website. Visit Business Services Online for information. The EIN of the person submitting the electronic file (right side). Usually this is the same as your business tax ID, unless you have an accountant or outside tax preparer who will be submitting the file for you. Click State ID Numbers. Any states for which taxes have been withheld will be displayed. Enter your state tax ID number(s). If you need to report wages or withholdings for another state click Add State (not common). At any point, when you Exit you’ll be asked if you want to save your work. In most cases you’ll want to answer Yes, so you may return later, to the same point at which you left off. When you return to the W2 / 1099 program click the Data Source button and choose to Load Previously Saved Data. – If you install on more than one computer the data is saved separately on each computer. – Data from the W2 / 1099 program is not included in a regular Procare backup; however, the source data (actual paychecks and vendor checks) is part of the backup. Click the W2 Instructions button to view or print instructions from the IRS. You’ll need this information to determine what box number (if any) your general withholdings should appear in. See “Map General Withholdings” below. Mapping simply means to assign, or link withholdings to a box on the W2. At the W2 and 1099 Program screen click Map General Withholdings. Skip this step if you’ve already done this and do not want to lose any manual changes you may have made. At the Map W2 Boxes screen you’ll see a list of any “general” withholdings you have used during the year for things like health insurance, retirement, employee child care, local taxes, etc. Refer to the IRS instructions to determine if any of these should be included in the following boxes. Box 10 – Place a check mark in the box. Note: If you use the same code letter(s) for more than one withholding, and an employee had more than one of those items withheld during the year, it will add those items together. Box 14 – Enter a short word or abbreviation to explain the withholding. Oregon note: In order to include the Oregon Transit Tax in your state efile export file, you must enter the abbreviation ORTRTX in box 14. Box 20 – Enter the name of a place for a local tax. None – If a withholding does not belong in any of these boxes leave it blank. You may manually enter items in another box later, if needed. In most cases you’ll want to Automatically Correct Social Security and Medicare withholdings. See: What does “Automatically Corrected” mean? Click Exit. This will import data from the payroll module to the W2s. You must review the W2s for accuracy. You may also make manual changes; for example, you may need to Report Employer Sponsored Health Coverage. Review the boxes for each employee by selecting their name (left side). If you have more than one location, be sure to review the W2s for people at each location. You may need to scroll down. Make any manual changes as needed, such as changing a number or typing data in another box. Hint: Use the BACKSPACE key (on your keyboard) to remove existing information from a box. Optional: In most cases the box to “Include this employee” should be checked (bottom of screen). If you do not want to include a particular person, remove the check mark. If unchecked, the employee will be excluded from printing W2s and the W3, as well as electronic filing. This may be appropriate if you need to reprint W2s for certain people, while excluding others. Box 18 will be defaulted to federal earnings from Box 1. If the earnings for your local tax are determined in a different way, you’ll need to manually adjust Box 18. When you have reviewed all your W2s and are satisfied with their accuracy, click Exit. Click Print W2s and W3. You may get a warning or error message at the top. Make sure you understand all warnings/errors, then choose how you wish to continue (lower right) and click Exit. Choose a Font. The IRS recommends 12 point Courier. Click Print Test W2. You may print the sample on an actual W2 or on plain, white paper. If using plain paper, hold the sample page up to the light against a real W2 form to check for proper alignment. Optional: Check “Show Print Rectangles” to include rectangular boxes around each item on the test page. This may help you to better test the alignment. Note: Do not use a photo copy of the W2 as a test page. Most copiers will magnify the page and the copy will not be the exact size of the original. If needed, click Adjust Printer to modify your printer alignment then print another test page. Use the Left/Right and Up/Down arrows (on screen) to make any needed adjustments. Positive numbers move the print area down or to the right. Negative numbers move the print area up or to the left. Ready to print? Place the first set of W2 forms in your printer, for example “Copy A”. Click Print W2s. There is no print preview. The forms will print immediately. Repeat for “Copy B”, then “Copy C”, etc. Place the W3 summary form in your printer. Click Print Form W3. Review the totals on screen. You cannot make changes at this point. Click Print. The e-file (a.k.a. efile) feature allows you to export a file that may be imported to the Social Security Administration (SSA) website. Click Print the W3. Even though you are on the W3 screen, e-filing includes W2 information for all selected employees (those checked to “include” at the Edit W2s screen). Review the totals on screen. Click the EFW2 Export button (top right). You may get a message that the submitter’s EIN is the same as the employer’s EIN. This is normal, if you are submitting the EFW2 for your own business. However, if your accountant or tax professional is submitting the form for you, their EIN should be listed as the submitter. Just click OK. Note: If you need to make a change to one of the EINs, return to the Company Info button; otherwise, proceed with the next step. 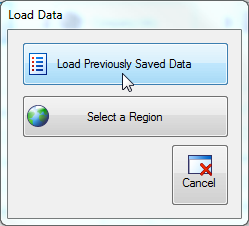 Specify a location to save the export file, such as your Desktop, then click OK. The file will be saved with a name like: EFW2_Name_of_Your_Region.txt. If you are in Oregon, a second file will be created for the state with a name like: EFW2_Name_of_Your_Region_ForState_OR.txt. Important! The Social Security Administration (SSA) does not allow the .txt file(s) to be encrypted. It is your responsibility to safeguard the file(s). Optional: You may Test the EFW2 File before submitting it to the SSA. Click the SSA button (upper right) to go to the SSA Business Services Page. Follow the SSA instructions for how to complete the e-file procedure. Note: Contact the SSA for any questions related to e-filing. Procare can only help with use of the W2 software. How do I e-file State Forms? Some states may accept the federal EFW2 format, as is.It depends on your state. The e-file format (a.k.a. efile) from Procare is accepted by Oregon* (see note) and any state that allows the federal EFW2 format, as is, without any other state-specific requirements. However, due to the great variation in state e-filing requirements, you may not be able to directly e-file for your state through Procare. If your state requires electronic filing, you may use the Procare W2 software to generate your W2 information, then go to your state’s website and copy & paste the information as needed. *Oregon note: In order to include the Oregon Transit Tax in your state efile export file, you must enter the abbreviation ORTRTX in box 14. See: How to Use the 1099 Software.